Our take on this knife is pretty simple: If you're looking for a sub $50 spring assist knife chances are you won't find anything better than Smith & Wesson's Black Ops SWBLOP assisted series. Smith & Wesson's latest offering is compact, sturdy and performs like a much more expensive knife. To open the SWBLOP series just give the ambidextrous thumb-stud a push. Just a small push will do it and the knife takes over. The blade opens fast, locks up definitively and is simple (and easy) to close again. The SWBLOP series has a convenient front mounted safety which locks the blade closed at your discretion. The composite body is super dense, but still lightweight. It's textured design provides a comfortable grip. Using the clip the knife rides well in the pocket (the removable clip provides a nice deep carry leaving only about 1/3 of an inch visible). 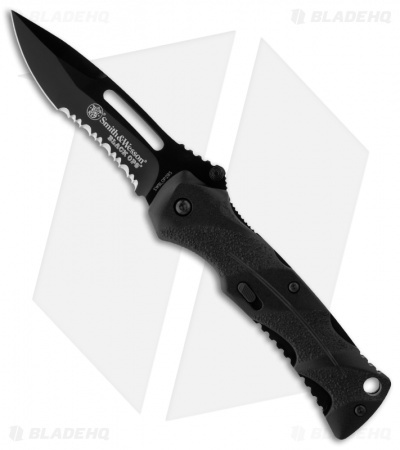 The black coated 4034 stainless blade comes partially serrated super sharp. The design is both practical and aesthetically pleasant.